Is your business celebrating Valentine’s Day this year? If not, you could be missing out on some serious love from your customers. According to the National Retail Federation, U.S. consumers are expected to spend over 20 billion on Valentine’s Day. How can your business cash in on Valentine’s Day? A simple Valentine’s Day email is the perfect way to show your customers some love and encourage them to do business with you. 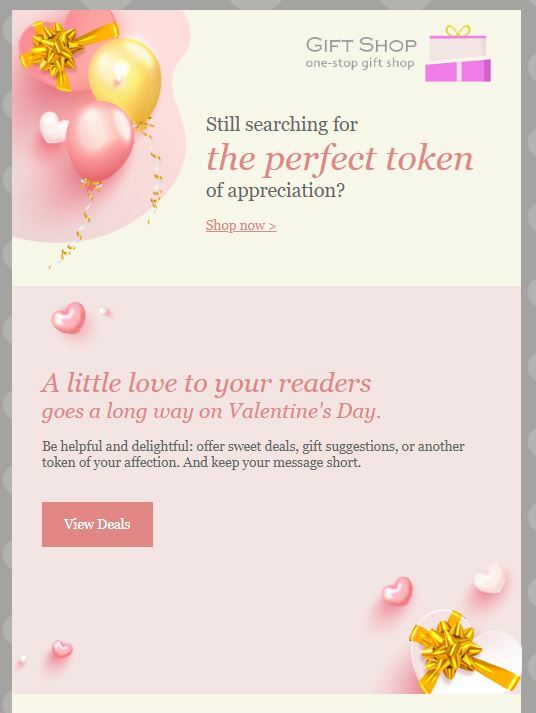 Here at Constant Contact, we’ve designed three great-looking Valentine’s Day emails to help you impress your customers. Whether you decide to send a heartfelt message, offer an eye-catching coupon, or invite your customers to spend their holiday at your business — a Valentine’s Day email template makes it easy. Don’t have a Constant Contact account? Sign up for a free 60-day trial! Wish your customers a happy holiday with our “Valentine’s Day Greeting” email template. This animated design helps you grab your readers’ attention and keeps your messaging focused with a paragraph and call to action. Use this template to get people to visit your website and make a purchase. If you want to offer sweet deals, gift suggestions, or another token of your affection to your customers for Valentine’s Day, our “Valentine’s Day Offer” template is your perfect match. You can create a quick gift guide and description for a variety of your offerings. Show off your best ideas. Anyone can attract more customers by sharing their Valentine’s Day specials using our animated “Valentine’s Day Promo” template. Preview your offerings and encourage guests to make a purchase in time for the big day. Which Valentine’s Day email is right for your business? No matter which template you choose, our mobile-responsive email templates look great on any sized screen. Customize each template with your business brand, add your content, and deliver your customers something special this Valentine’s Day. Ready to get started? Log in to find the right Valentine’s Day template for your business! New to Constant Contact? Sign up for a free 60-day trial!